Peshawar: Muhammad Irshad, a Peshawar based Journalist who works for an Urdu language newspaper, has not been able to sleep properly lately. He wakes up at odds hours in the night and feels fatigued in the field. Irshad says he was been suffering abnormal sleep patterns due to the burden of work and covering violent incidents day after day. Irshad is not alone. Journalists in the Khyber Pakhtunkhwa (KP) province, indeed the entire Pakistan, have been increasingly complaining of stress in the wake of relentless incidents of terror that they have to cover. Since 2001 more than 45000 people have been killed in bomb blasts and suicide attacks. At least 55 persons, including 36 civilians, 15 terrorists and four SF personnel, have already been killed in KP in terrorism-related violence in 2015 (till February 15), according to partial data compiled by the South Asia Terrorism Portal (SATP). During the corresponding period of 2014, terrorism-linked fatalities stood at 156, including 103 civilians, 41 security forces personnel and 12 terrorists. More worryingly, 2014 witnessed the Peshawar carnage, one of the worst act of terrorism in Pakistan in which more than 138 school children were killed. Covering terror incidents have taking a toll journalists who get no break and little support from their organizations despite showing clear symptoms of stress. Irshad routine work and performance has been was disturbed due to suffering from stress. “I used to be able to file five stories in a day but i can’t seem to cover two now,” says Irshad. Professor Dr.Rizwan Taj, a psychiatrist based in Islamabad told News Lens that terror incidents causes psychological trauma to people who witness them. He said as journalists witnessed victims of bomb blasts in the field regularly, they are susceptible to post-traumatic stress disorder and disorders like depression and fatigue. “Covering tragic incidents and stories of suffering could cause major trauma to journalists who witness and cover terrorism and conflict routinely,” said Dr. Taj, who heads the psychiatry department at the Pakistan Institute of Medical Sciences (PIMS) in Islamabad. He said Pakistanis are passing through a traumatic time due to unrest in the country. The most common traumatic disorders in Pakistan are anxiety, stress, abnormal sleep and also schizophrenia. “KP is more exposed to trauma as most of the terror incidents occurred there,” says Dr. Taj. For the last two months, Irshad has been going to the Competence and Trauma Center for Journalists (CTCJ) at the University of Peshawar to receive psychological counseling for post-traumatic stress disorder. Irshad has completed two months of therapy at the center. He has to go for another one month to receive psychological treatment at CTCJ but he already feels better, he says. 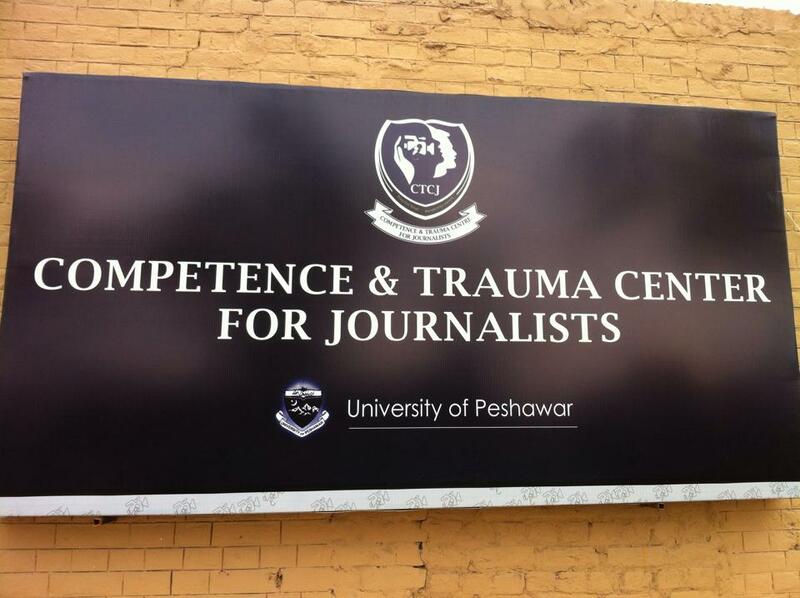 The Competence and Trauma Center for Journalists has been treating journalists from Khyber Pakhtunkwha and FATA since November last year to help them overcome post-traumatic stress disorder. The center is joint venture of Department of Journalism and the Department of Psychology at the University of Peshawar. The Deutsche Welle Academie, Germany’s Germany’s leading organization for international media development, has technically and financially supported the project under a Memorandum of understanding (MoU) with University of Peshawar for a period of three years. Chairman Department of Journalism, Professor Altafullah Khan, said Journalists working in KP were exposed to violence and threats. He said journalists were offered free psychological counseling at the center. So far, 20 Journalists have been registered at the center set up in the Department of Psychology at the University of Peshawar. Six of these journalists have completed therapy. Dr.Irum Irshad, Chairperson of the Department of Psychology at the University of Peshawar, says that the six journalists have been feeling much better since they joined the center. She said a major problem in psychotherapy is helping patients realize that they suffering from a disorder. Country Director for DW Academie Karin Schadler told News Lens Pakistan that her organization was dedicated to the welfare and professionalization of media and journalists in Pakistan. She said center was established to provide psycho-social support to journalists in KP and FATA. “DW Academie intends to establish a similar center in Baluchistan also,” said Schadler.